W Atlanta-Buckhead marks the second acquisition for WLI, a private real estate fund created by Woodbine Development Corporation (Woodbine). Mark Elliott and Todd Ratliff of Hodges Ward Elliott served as the brokers for the transaction. Marriott International will continue to serve as the hotel’s operator. W Atlanta-Buckhead’s amenity lineup includes three F&B outlets: Cook Hall, Living Room and Buckhead’s only rooftop bar, Whiskey Blue. Scott Gerber, principal and CEO of Gerber Group that owns and operates Whiskey Blue, intends to evolve and update the bar to complement the major renovation WLI is planning for the hotel. Other offerings at the property include a 24-hour fitness center; yoga, barre and boot-camp classes; an infinity-edge pool overlooking the famed Peachtree Road; and 11,000 square feet of flexible indoor/outdoor meeting and event space. The destination also boasts adjacency to luxury high-rise residential projects and best in class retail shops—the extravagant combination of which has earned the Buckhead neighborhood a reputation as “the shopping mecca of the Southeast.” Top draws along Peachtree Road include the boutique Peachtree Lenox Building, Lenox Square Mall, the luxury Shops Around Lenox and the Buckhead MARTA Station. 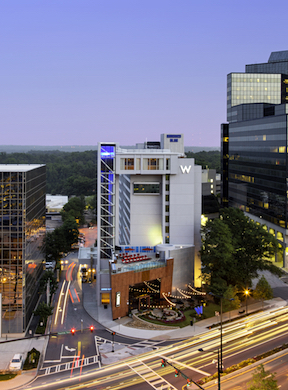 WLI’s acquisition of W Buckhead-Atlanta is the real estate fund’s second purchase. Woodbine’s ongoing partnership with the Marriott International—which is currently growing the W brand around the world and working to innovate in the lifestyle space—now includes more than $225 million in active development projects.